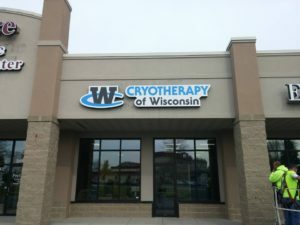 Paying to be frozen? Giving this Cryotherapy thing a try, by the ones who hates being cold! When was the last time you did something for the first time? 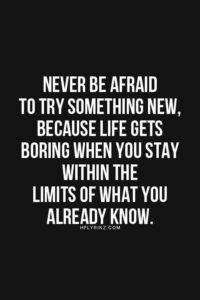 When was the last time you stepped out of your comfort zone and did something different? That is what life is all bout! New adventures, new experiences, this is how we grow. Sometimes this means doing something out of your normal routine, something new. Last weekend, after the Bellin Women’s Half Marathon, I did just that! 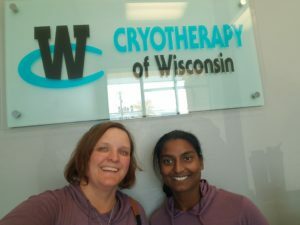 On Thursday, my friend Jessica tagged me in a post for Cryotherapy of Wisoconsin offering special for those running in the event. Now, please understand, this girl does NOT like being cold. Yes, I run year round, but I dress for the elements. Cryotherapy has always intrigued me and I often wondered what it could do for me in terms of recovery etc with all the running and training that I do. I also have been dealing with some ankle and knee issues, so I wondered if this would help with that also. I decided that I had nothing to lose. $20 post race special to give it a try? Sign me up! The next thing I knew, I had an email from Mandi with everything I needed to fill out before my appointment! All I needed to do was get there! 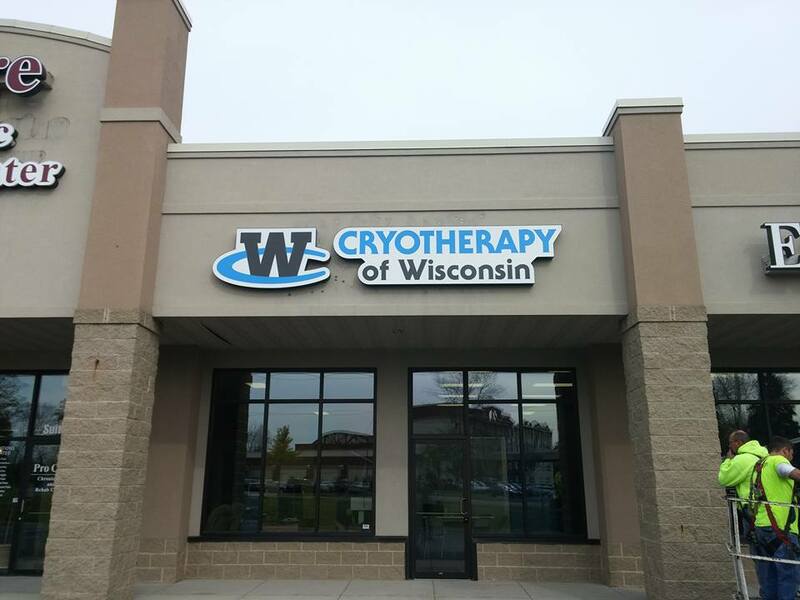 (from their website): What is it: Cryotherapy is a safe and natural therapy that stimulates the natural response of your body to cold, resulting in the reduction of inflammation and swelling. The benefits have been studied and refined in Asia, Europe and Russia for over 30 years. 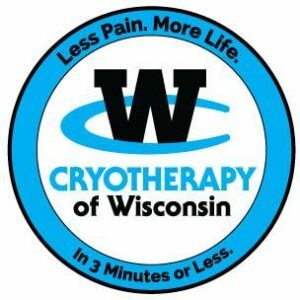 Cryotherapy has recently been introduced into the USA and is popular among doctors, chiropractors, physical therapists and most professional athletes. The treatments have been used to accelerate the production of collagen, to improve skin elasticity and texture, to reverse skin aging, and to reduce the appearance of cellulite. Cryotherapy boosts the body’s metabolic rate, which accelerates weight loss outcomes. 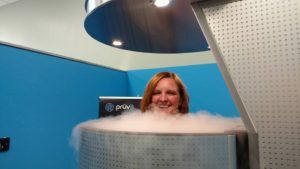 How does it work: Cryotherapy uses liquid nitrogen vapor to lower the skin surface temperature from normal body temperature by 30 to 50 degrees Fahrenheit in 30 seconds or less and keeps it that way for two to three minutes. The skin reacts to the cold and sends messages to the brain that acts as a stimulant to the regulatory functions of the body. The skin exposure to the extreme temperatures triggers the release of anti-inflammatory molecules, endorphins, increased oxygen in the blood and the release of toxins. Cryosaunas have been safely used for over 30 years! In a nut shell: It gets you really really cold, really really fast, sending your body into action to reduce pain, inflammation, swelling and more! My good friend Asha and I both had appointments for 1:15pm. This was giving us a few hours to rest and relax after the half marathon. As it turns out, we needed this few hours to actually thaw out from the morning, as it was only 38 degrees at 8am when the race started… and we ran straight into the cold wind for 13.1 miles! (more of that adventure here). I ended up getting there a few minutes before her and they got me started right away. The Cyrosauna is a large cylinder with a door that swings open. When I stepped inside, I could instantly feel the cold! Once the door was closed, I the floor was raised up so that my head is above the top of the chamber and I was told that I can have an awesome puffy pair of mittens… but there’s a catch. To get the mittens, I had to exchange them for the robe! Really? Yes, the more skin you have exposed, the better results you will have. OMG! Now it was getting real! Since this was my first ever visit, they do 2 sessions back to back. The first one was for 2 minutes. I will not lie… IT WAS COLD! Even though it felt like it was forever, the next thing I knew, I had 10 seconds left! I got my warm robe back (and gladly gave back the puffy mittens). After a quick temperature reading of my skin (a whopping 42 degrees, it was time to come out and warm up. We now needed to let my body warm back up before I headed back in for round 2. It was about this same time to Asha arrived so we chatted for a bit while I warmed up and then she was off to get changed! The next thing I knew, my skin temperature was back up to 86 degrees so it was time to go again! This time it was ONLY 90 seconds 🙂 90 seconds seemed like a walk in the park after 2 minutes before! Time’s up! once again, trade robe for gloves, skin temperature reading and time to get out! I survived! Next it was Asha’s turn! We all chatted and laughed about a variety of things while she was in the chamber – mostly to help her keep her mind off how cold she was! At one point, she looked at me and asked me how I was able to stand in there and make it look like it wasn’t that cold! Trust me, I was cold, I was just trying really hard to ignore how cold I was! While Asha was in the chamber, it seemed like I could already tell a difference. 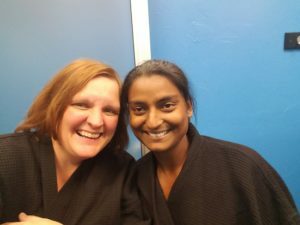 My body was quickly coming back to normal temperature and I felt extremely refreshed. After Asha came out of the chamber, I went to go get dressed again, while we waited for her temperature to come back up. It took Asha longer to warm back up, so she was starting to jump around, trying to get herself warmed up – hey, a girls gotta do what a girls gotta do! Finally, it was time for her round 2. Yes, there was more chatting to keep her mind off the cold, but she did fabulous! Before we knew it, she was done too. 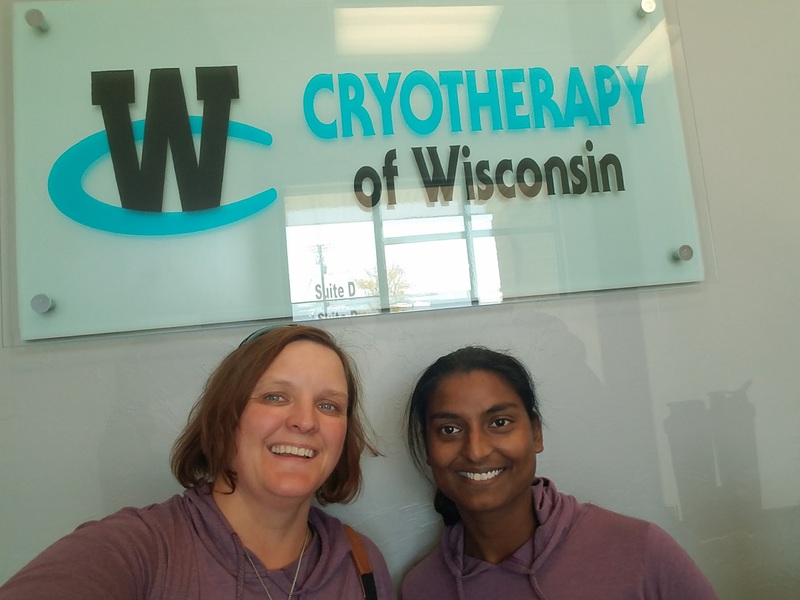 In the end, we both survived our first cryotherapy session! When I walked out the door, I could already feel a difference. The true test was going to be how I felt later that day and tomorrow! Results: I didn’t end up taking my normal post half marathon nap on Saturday and only had minor knee pain for the rest of the day. 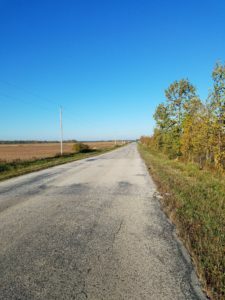 Usually, it is the day after a long run or race that I really feel it, or even 2 days later. This time, the stiffness and soreness post race was noticeably less the day after! And 2 days later? 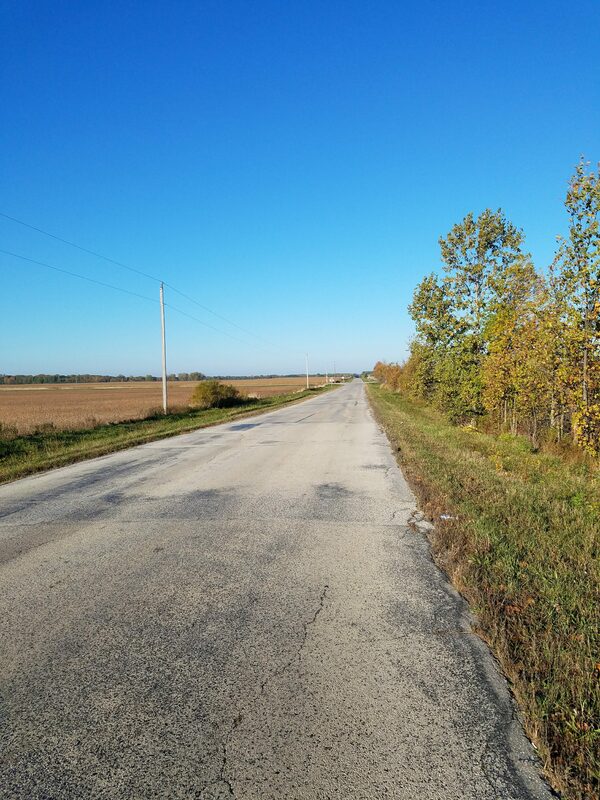 You be the judge… Monday morning I went for a 19+ mile bike ride! Yup, less than 48 hours after my half marathon, and my cryotherapy appointment, I knocked out an almost 20 mile bike ride. Will I go back again? You betcha! Want to give it a try for yourself? 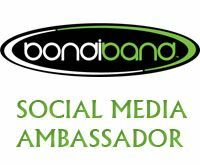 Give them a call and set up an appointment! You won’t be disappointed! Just let them know that the Crazy Hamster sent you! Ok, maybe you better actually give them my name since I don’t think they will find Crazy Hamster in their computer! 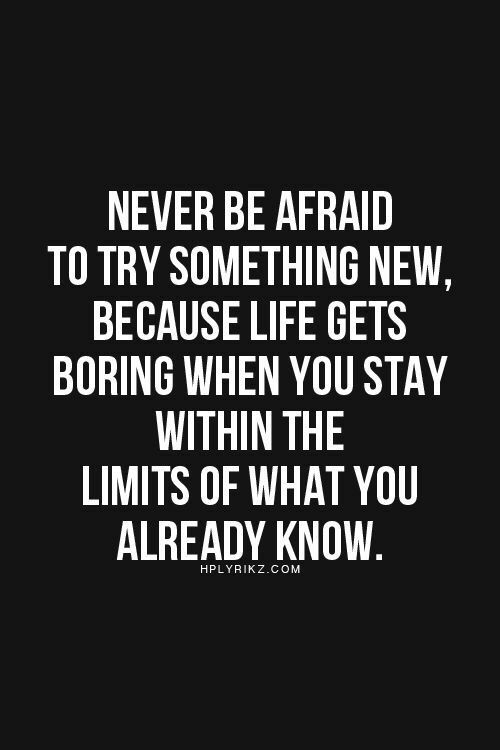 Go ahead, step outside your comfort zone… you never know what you will find! I would love to try this sometime! Thanks for posting about it and reminding me! Glad you saw benefits! Once I got past how cold it was, it was awesome! Give it a try! let me know what you think! Fear Less, Live More! Bellin Women’s Half Marathon, Sarah Reinertsen, great friends and FREEZING Wisconsin temps! Random thoughts from 39,000 feet – Which way is your river headed?